64 Million Artists is a national project funded by Arts Council England, which aims to unlock the creative potential of everybody in this country. Using a tried and tested, simple and free process, we are encouraging people from all walks of life to commit to a simple process: Do, Think, Share – to help them find their own creativity. We know that we are all creative - you, me everyone. We just need to realise and embrace it. We work with employers across the Arts and Culture sector and in community settings, and are currently working in collaboration with Hull 2017, UK City of Culture on a city-wide intervention to test what happens when a whole city is challenged to be creative. We have worked with 52 organisations across the city, each of which has set a creative challenge to Hull and to the wider 64 Million Artists challenger network as part of our weekly challenges. 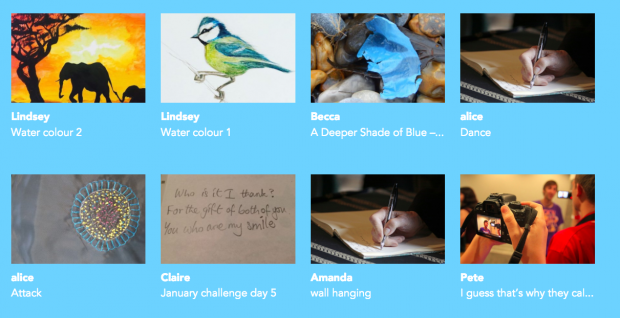 We have left notes of inspiration for people to find, given new life to our recycling, mapped our cities, and we have so many more exciting tasks to come that you can be part of. We love challenges because they naturally invite people and participation, and it’s always fascinating to see the varying responses that individuals have to the same task. There’s something really exciting about the different ways in which we each see the world, and the conversations that occur when we share and create together. It’s these responses that drive us forwards. In the same way that libraries work to cultivate a culture of learning and doing, 64 Million Artists are working with individuals, in organisations and community settings, to create a culture of everyday creativity in which we can all actively participate. We see fantastic potential for library partnerships because of our mutual commitment to accessibility - of giving people the opportunity and tools to access knowledge, learning and ideas and a community in which to thrive. We think that being creative is all about trying something new, about developing as an individual and collaborating with others, but most importantly, we believe that creativity is for everyone. Be part of our journey - be 1 in our 64 million. Keep up with us day to day on Twitter @64M_Artists, on Facebook or on Instagram.